Your goal in Pocket Madness is, for a change, not to collect the most points but to make all the other players collect the most negative points. Those are called Madness in Pocket Madness. I think we can all agree that a little madness can be fun, but too much of it is a huge problem. Ten points of Madness, for instance, are too much because they make you lose the game. That’s why you want someone else to get there first. Pocket Madness is a set collection game played over multiple rounds. 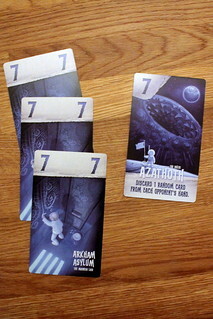 Each round, some players – most players, usually – will gain Madness tokens. The game ends after the round a player got to ten Madness points and the player with the least Madness wins. The sets you have to collect are simple: from cards valued six to twelve you want to either make sets of three (or more) of a kind or straights from six to twelve. 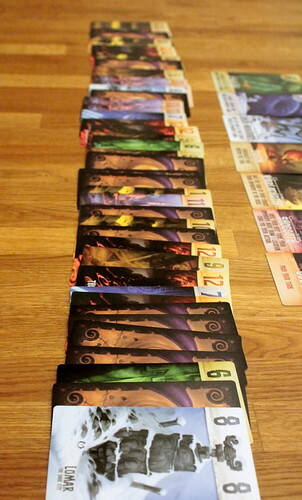 If a player has already collected a set, she may choose to play it instead of taking new cards. With a set of identical cards, that means she has collected enough knowledge of one of the Old Ones to open a portal to their strange dimension. She takes the Portal Card corresponding to that card value, even if another player already has it. Surprisingly, opening a Portal does not drive you mad. The Old Ones, for a change, are genuinely grateful to whoever opened the gate. Each portal card has a different special effect you may use once before returning the card. Cthulhu, for instance, lets you pass one or two cards to your opponents – very cool in a game where you win a round when your hand is empty. Gug lets you pass your turn, so you don’t have to draw cards when they really don’t go with your hand. Shoggoth is especially popular, he forces all your opponents to draw exactly one card for their next turn. And the other guys are just as fun, as long as it’s you who opened the portal. Collecting that many cards takes nerves because cards in your hand at the end of a round may drive you quite mad. A round ends in one of two ways. If the cards in the line run out, all players get one last chance to play sets. For cards they have left afterwards, they score Madness Points: one point for every distinct value of cards. Worst case that should be six points – if it was seven you should have played a straight. But six points is still plenty in a game that ends at ten. The other way to end a round is for one player to run out of cards. That player discards half her Madness – the only way to get rid of the stuff – and all other players take one Madness. It’s obvious from reading the rules summary that Pocket Madness is a light game, all you do is build sets from cards. But with most of those cards visible before you draw them and having some control over which cards you draw, there is a tactical element there. Not a big one, but it’s there. The tactical element is even bigger when you remember that the value of each card is also how many copies there are in the game. There are only six sixes, but twelve twelves. Keep that in mind and your chances to win go up. Use the Portal Cards well and they go up even more. Luck is always a factor, but it’s far from everything. I can’t end this review without mentioning the art by Mathieu Leyssenne. The illustrations are gorgeous, and you’ll be hard-pressed to find more adorable paintings of the Old Ones. Between the balance of luck and tactics and the beautiful design, Pocket Madness is a game that works for everyone. Just make sure you have at least three players, it’s considerably less fun in two. Pocket Madness is a much lighter design than other games by the team Cathala/Maublanc, but they pull it off just as well as their heavier games.